Elementor gives you the power to create designs from scratch, but sometimes you might want to save time by using a premade template. Here are 10 places where you can find pro and free Elementor templates to download and use on your sites. Looking for the best places to find Elementor templates? While Elementor gives you the power to create designs from scratch, sometimes you might want to save some time by inserting a premade template. 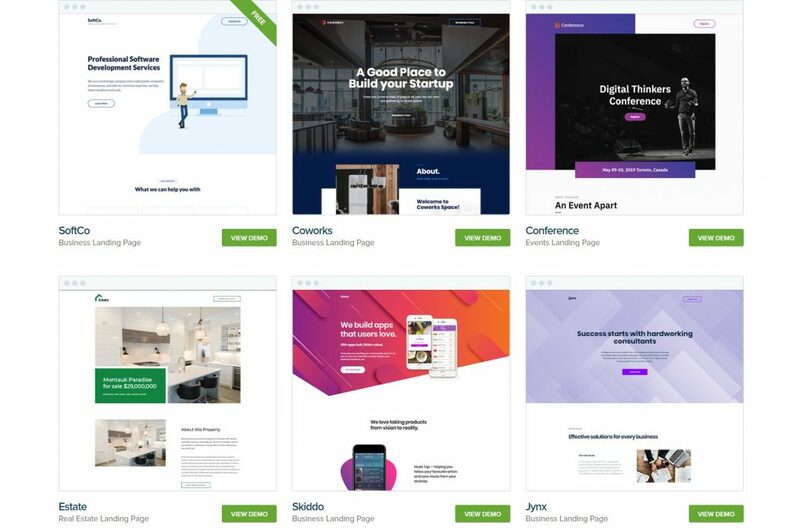 To help you do just that, we’ve collected 10 places where you can find free and premium Elementor templates to use on your sites. 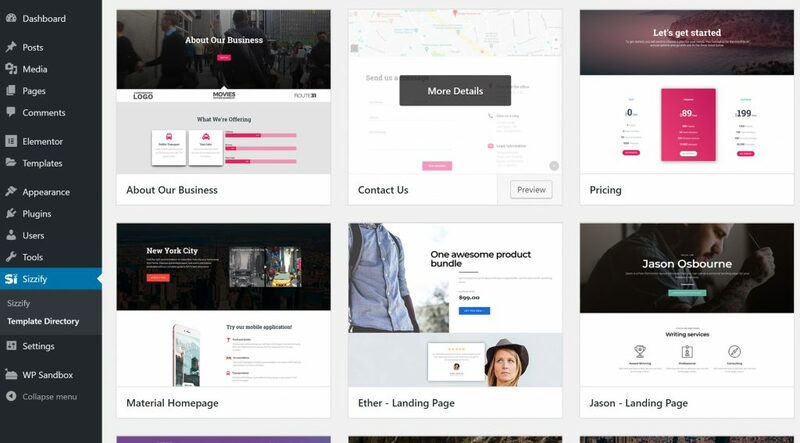 Envato Elements is a huge collection of FREE Elementor page and block templates. 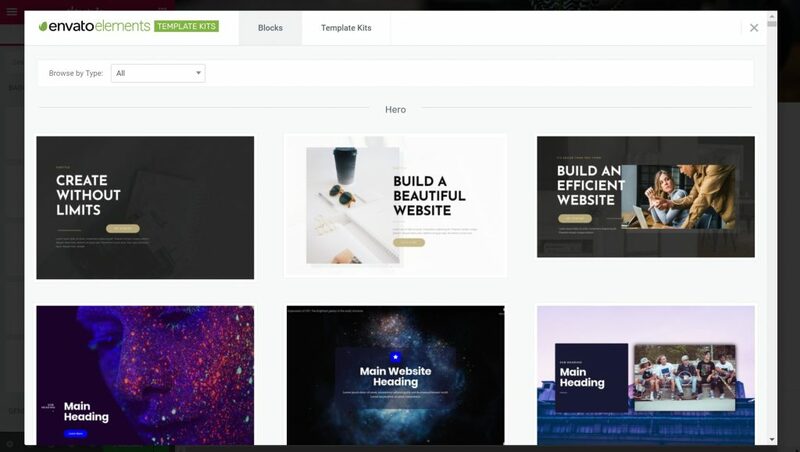 Currently, you get access to over 2,000 Elementor templates spread across 70 template kits, including block templates and templates for Elementor Popup Builder. Any template marked Pro just requires Elementor Pro to use – that does not mean you need to payEnvato to use it. Once you import a template, it will be available in the My Templates tab in Elementor. 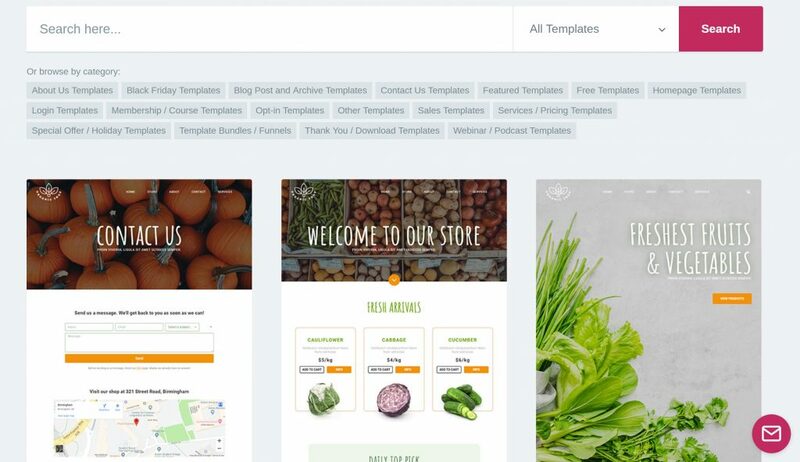 TemplateMonster is a popular marketplace that offers a dedicated section just for Elementor templates. 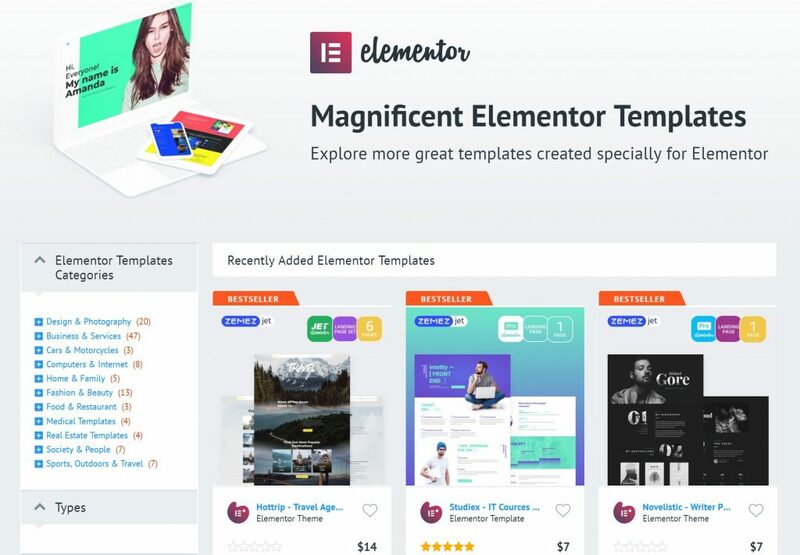 Currently, there are well over 100 premium Elementor templates on offer. Most templates cost just $7 or $14 each, though you will find a few templates that deviate from that pricing structure. The reason for the price difference is that the higher-priced templates usually come as a set of five or six pages, rather than just a single template. You can also find section design sets for Elementor. For example, the Testiz set comes with 17 different template block designs that you can drop into your content. Again, these templates are 100% free, though the developer does include an option to leave a $5 tip if you want to support the project. When you download the templates, you’ll get a big ZIP file with a JPG screenshot of the template, as well as the JSON file that you’ll need to import to Elementor. You can then pick and choose exactly which templates you want to add to your Elementor template library. EasyThemePacks is a set of premium niche-focused Elementor templates. Some of the templates rely on Elementor Pro widgets, but the description for each template will clearly mark what those widgets are. Even if you don’t have Elementor Pro, you’ll still be able to use the template (just sans the Pro widgets). Another nice thing is that you have the rights to use all of the images included in the template. Sizzify Lite is a free plugin from ThemeIsle that, in addition to adding 11 new Elementor widgets that you can use in your designs, also tacks on a bunch of new page templates that you can import as desired. Currently, Sizzify Lite includes 13 different Elementor page templates. Most of these templates are landing pages, though you’ll also find templates for sub-pages (like an “About Us” page). There’s also a $39 Pro version of Sizzify that adds 14 additional Elementor templates to the mix. 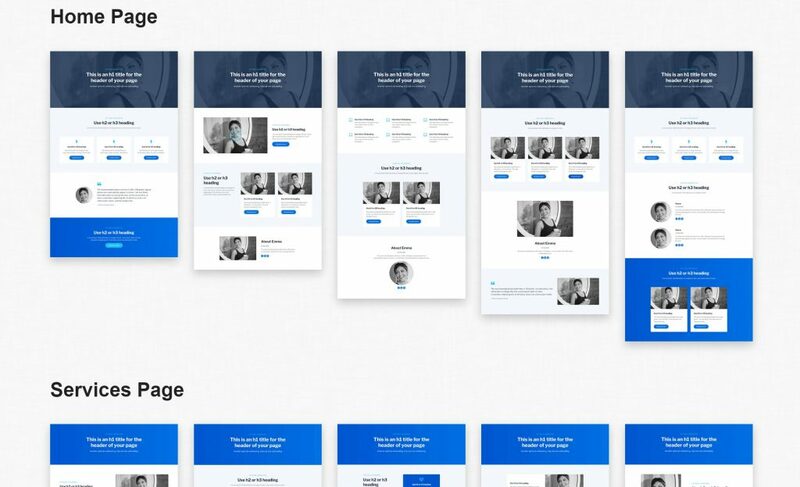 ElementorHQ is a “multipurpose Elementor template pack” from the folks at CakeWP. It has a unique approach to templates. Rather than giving you templates spread out over different niches, ElementorHQ gives you one single set of cohesive, but flexible, templates. You can see the full demo here. Using Elementor, you can add or remove page sections as needed to make the designs your own. 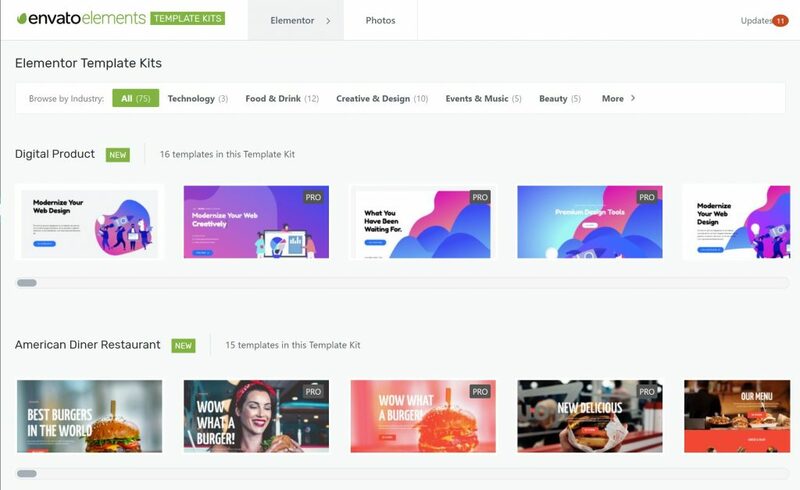 ElementorHQ will cost you $35 for access to all of the templates. The Landing Factory is a big collection of 323+ Elementor Pro templates. 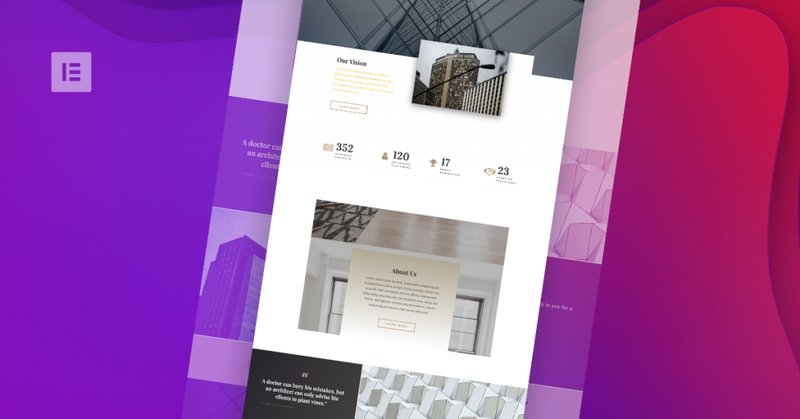 While the name suggests that these are all landing page templates, you’ll actually find themed sets that cover other uses, as well. For example, you’ll find templates for Contact and About Us pages that have the same niche/design as a landing page template. Beyond that, the templates cover a range of different niches, with designs for everything from organic food shops to generic businesses, travel agencies, construction companies, and more. Personal – use on your own sites – either $16 for individual templates or $168 per year for access to all templates. Agency – use on client sites – either $63 for individual templates or $336 per year for access to all templates. You can also grab lifetime agency access for $597. When you download the templates, you can choose from different color schemes. Or, you can even create your own color scheme to apply before downloading, which is neat. Elementorism is a set of 49+ free and premium Elementor templates from CSSIgniter. The templates are all divided into specific niches, like templates for weddings, travel, restaurants, etc. Most of them are paid, but you can also find a few free templates sprinkled throughout. To get access to all the templates, you’ll pay just $39, which includes lifetime usage and one year of support and updates. 10. The Elementor Template Library! Finally, we’d be remiss if we didn’t mention our own library of Elementor templates! You can search and filter them as needed to find the right template. And inserting a template is as simple as clicking a button. You can browse all of the page templates here. Get your dose of some spectacular templates for Elementor, available for free, curtesy of AnalogWP. Get the templates here. That wraps up our thoughts on the best spots to find paid and free Elementor templates. If you’re not sure how to import an Elementor template from a JSON file, check out this help article (the instructions are at the bottom of the article). And if you have any other questions about using Elementor templates, ask away in the comments! We have a lot more where that came from! Join 588,677 subscribers who stay ahead of the pack. 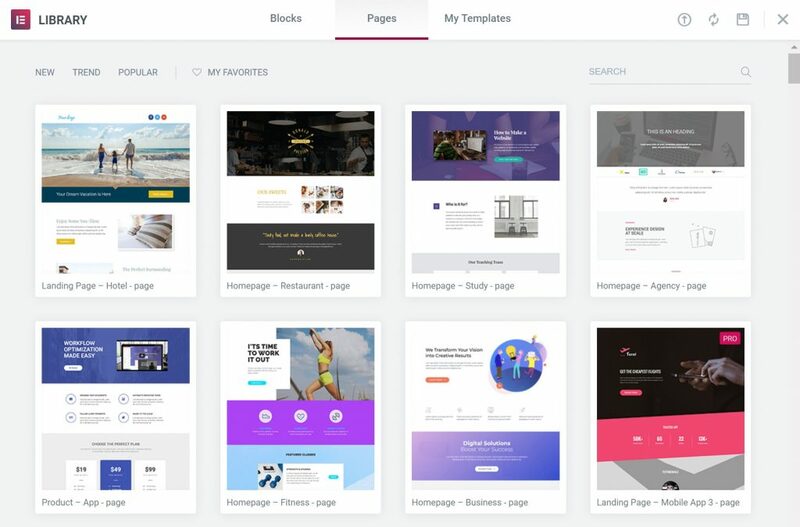 Elementor has one of the most organized libraries of any page builder. It’s a pleasure to look through and find almost anything you need. I would say Envato Elements is a close second. I absolutely love the Envato Elements Template Kits plugin. ?? Woooooooow now I have a problem of choice. More awesome templates. By the way, I like the widgets options offered by Sizzify Lite. Does it mean that I get to use Widgets when using these templates? This will save me a lot of work. The current Elementor plugin installed on my website does not have this option. I, personally, love TemplateMonster Elementor templates – they are so professionally built! Most of them has not only a single page, but are provided as a set of pages, which is very convenient. I had never had any problems customizing them with Elementor. TemplateMonster was my favorite marketplace even before I started using Elementor and now I love it even more! I recommend it to everyone! Good article with great refs! The life of a web developer has become simplified all thanks yo Elementor. Great list to checkout. Some I know, some I’ve never heard of. Astra didn’t make the cut? It’s also worth mentioning that with WPTemplator is a great tool you can create your own and share them. It’s what we have done at Online Mastery offering private templates to our clients. Great resource but one of the bests is missing! AnalogWP has really good design and very well crafted templates. Elementor always comes up with useful articles & updates. Thank you! Wow. These are great. I didn’t even know about the Envato Elements. That’s handy. Thanks! Great list – nice work! But huge glaring omission of AnalogWP templates – https://analogwp.com. The best Elementor template designs I’ve ever seen. Completely agree with you, Dave. AnalogWP is a not to be missed resource. ElementorMarket.com should be on this list for sure. Elementor is great and improves day by day. I love it! Seriously, there’s no doubt about what you just said. I will go premium when I’m ready to take my business to the next level. No need to buy additional optin forms for instance, as this will be taken care of my Elementor. I can’t wait to find out how their optin pages will look like. 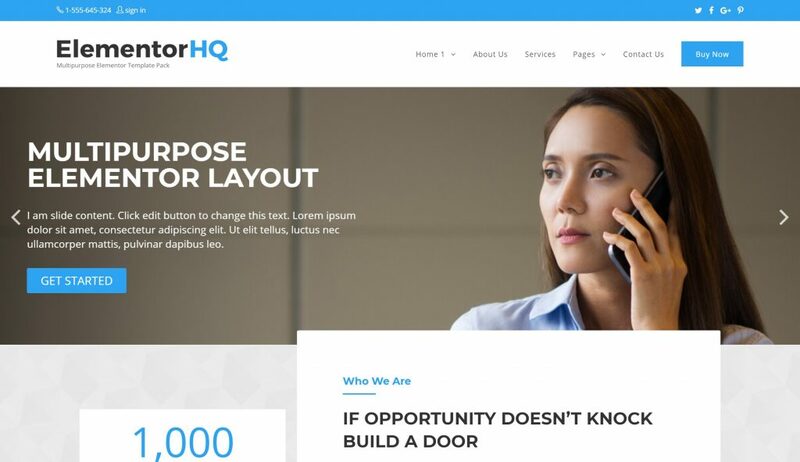 I hope they will be as amazing as their landing pages templates. Thanks for this resources. I totally dependent on elementor. Thanks for sharing. It’s awesome. I use elementor template to design my website.